At the last championship of Russia there were many interesting fights and talented sportsmen. One of such sportsmen, undoubtedly, is Sergey Bogoslovov. The style of Sergey's pulling makes his fights exciting and spectacular. "I'm 24 years old, I work as a coach in a municipal leisure institution, I also train there. I started armwrestling when I was 16 years old. Before that, I tried many sports - basketball, karate, boxing, but I could not achieve any special results. Then, at school, the older guys, who had experience in armwrestling, made a table for the fight, after what all the children of the school fought during brakes. So it turned out that I fought well, although I did not know any technique, after such a struggle my hands always hurt. Then I found an arm wrestling section not far from my home, and I began to study there with Alexey Zarubov, who is still my coach to this day. My first competitions took place after four months of preparation, these were district competitions between the regions where I took second place and I was pleased with the result. To date, my biggest achievement is the gold medal of the Russian championship". "After the last competition at Anas and Moscow championships, my coach and I analyzed my fight; we took into account the mistakes and identified weaknesses. With all this in mind, I changed the program, made up a training plan, and I started training. In principle, everything went as we planned, but at the end of the training, we added footwork and because of the genetic characteristics, they quickly added the muscle mass. So I can’t lose the weight to the category of 85 kg, but I was not particularly upset about this. I think that at this Russian championship I didn’t show my best shape, but I know where to add and become stronger". "In training, I usually only use iron and very rarely compete at the table at the end of training. But this time I decided to single out some days for pulling, in order to better feel the table and believe that it benefitted me. 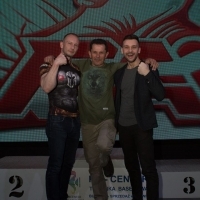 I want to say a big thank you for my sparring partners Sergey Tokarev and Ivan Matyushenko, who gladly accepted guests and shared their advice". "I tuned very seriously to all the fights. I will not single out any of the rivals, since this is the championship of Russia and only the best ones get there. The only thing I note is that it was hard to keep calm morally after the defeat in the preliminary matches on the right hand. But I managed to pull myself together, remember all my work and win in the final and super-final duels". "I will miss the European Championship, it's a financial issue. I spent a lot of money on this preparation and cover all expenses from my own pocket. Therefore, I will prepare for the Worls. I will have enough time to prepare well and show a worthy fight". We can say that in the category of up to 90 kg was one more top-puller. We want to see Sergey in the fight at international tournaments sooner, because there is someone to compete with. And how do you think, what successes are waiting for Sergei at the international level? Stay tuned, write comments and watch the news on armpower.net.